Dr. Larry G. Peters is an internationally acclaimed scholar and an initiated shaman. 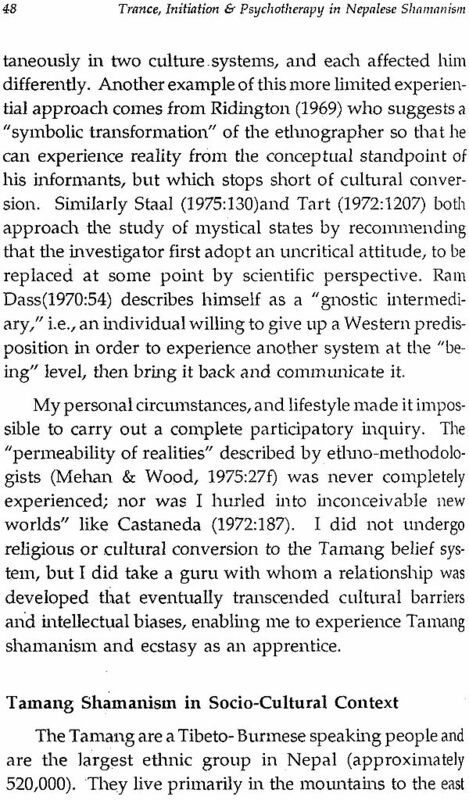 Result of lifetime's researches in the Himalayas, Trance is a meticulous study exploring the hidden terrains of Tamang and Tibetan Shamanism. An exquisite fusion of creative writing and anthropological research, the book evaluates the relevance of shamanic practices in a modern-day Nepal. 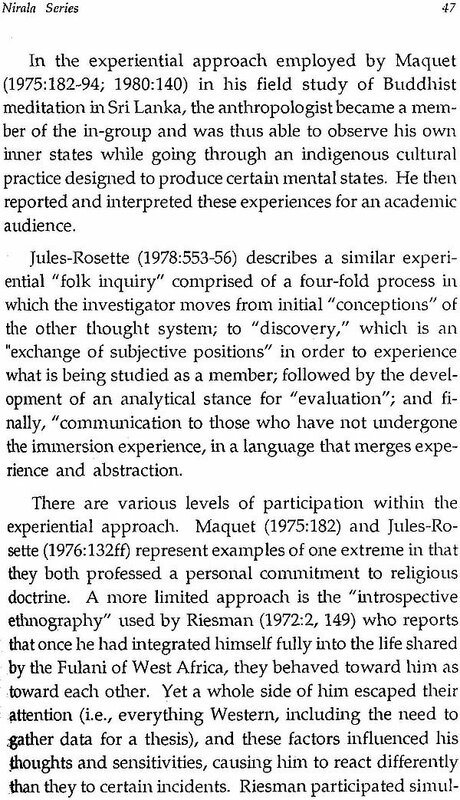 Divided into four major sections, the book opens with a study of phenomenology of Shamanism as a spiritual discipline. 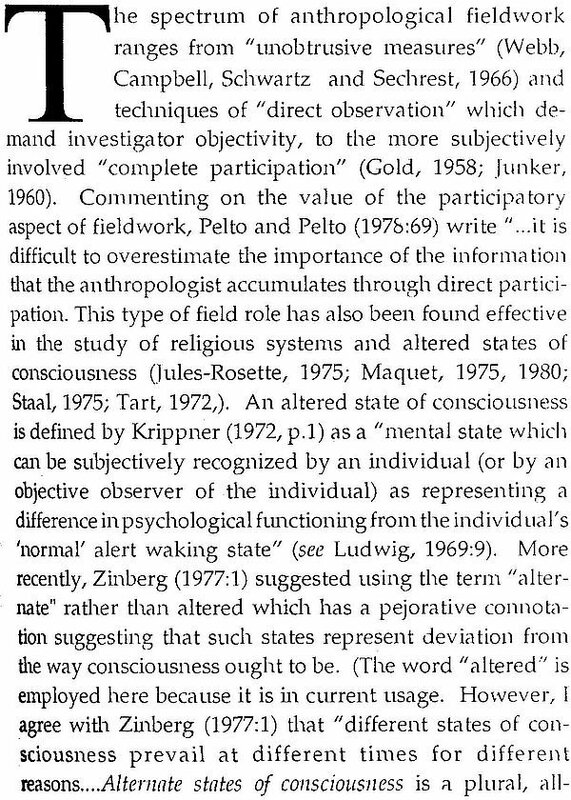 Shamanism, Dr. Peters claims, is humankind's first mystical tradition. 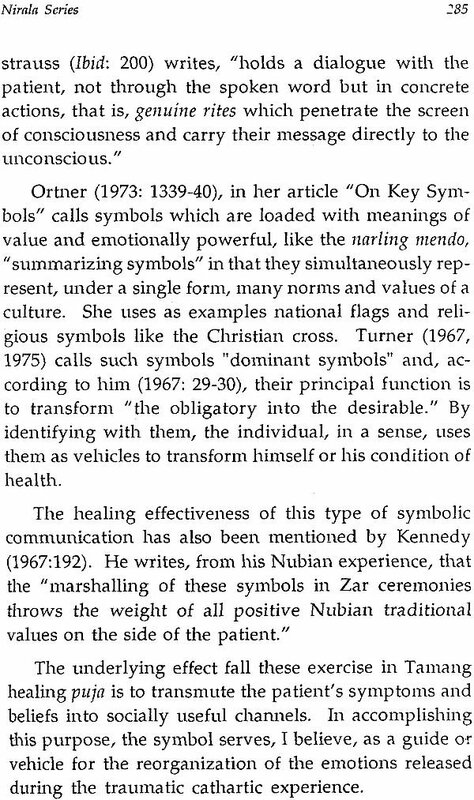 It is a cross- cultural phenomenon. 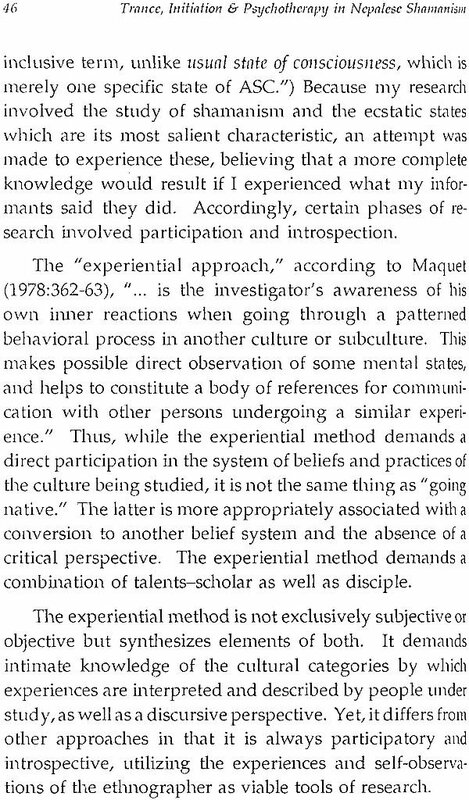 Shamans were the first to explore the inner space in a disciplined way. Shamanism, he adds, overlaps with, and is at the origin of other younger spiritual traditions, like yoga, Vipasana and Tantra, which had continued the development of the disciplines of spiritual transformation. "The shaman's mystical path," in Dr. Peters' words, "is an archetype, a universal pattern. It is not a prehistoric or a dead artifact but a living fossil possessing the same vital psychological foundations as later mystical traditions. Against this ideological backdrop, Dr. Peters ventures to study the cultural archetype of what it is to be a shaman in a Nepalese society and finds out that Tamang shamanic initiatory process comprises a psychotherapeutic system. The chapter that follows documents rare letters he sent home to his friends. 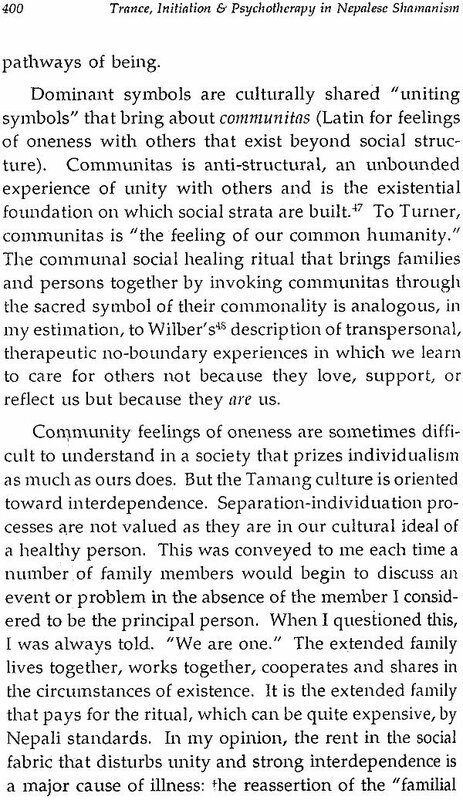 These letters tell us of remarkable shamans that he met during his anthropological fieldwork in Nepal. 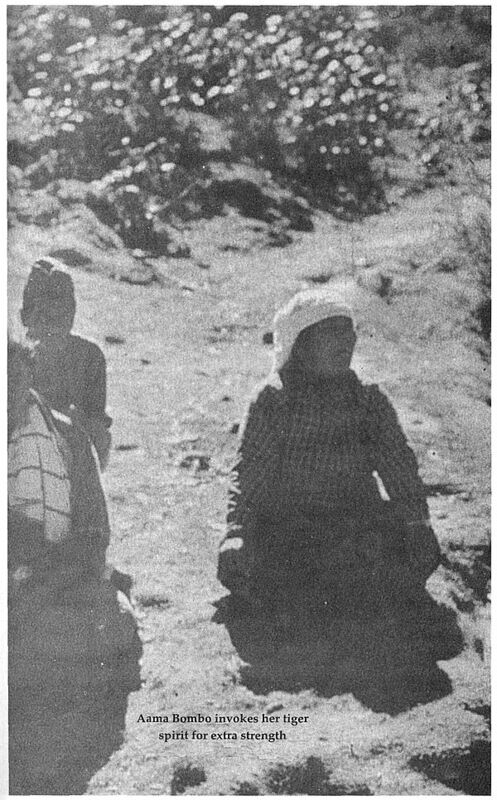 The chapter next effortlessly sketches the visions of Nepalese mindscape during Dr. Peters' journey to Kalinchowk shrine with Aama Bambo, a Tamang shaman. Focusing on the transformative nature of mystical experiences in Tamang shamanism, the author then moves ahead to discuss the Tibetan healing rituals of Dorje Yudronma, a fierce manifestation of feminine cosmic force. 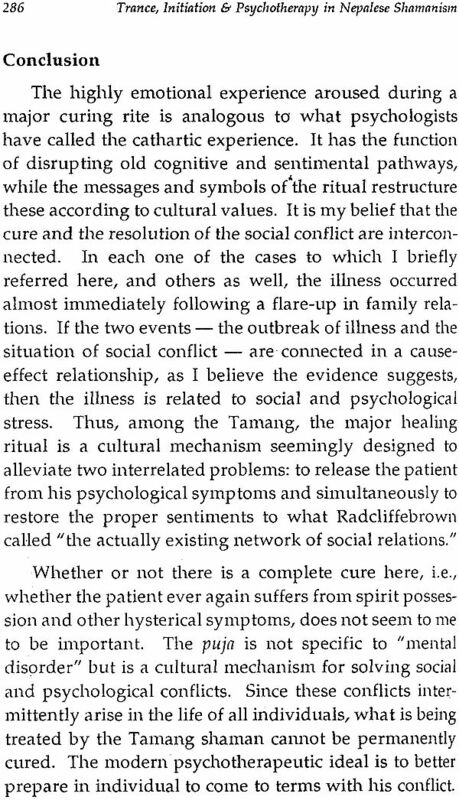 Despite reservations on Lhamo's intensely aggressive style of healing, Dr. Peters seems to be in awe of her magical abilities and her paranormal knowledge. 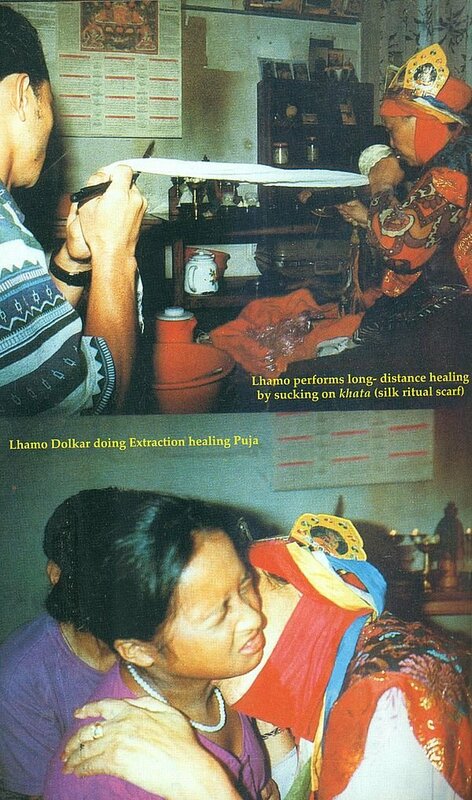 Dr. Peters interprets Lhamo's violent exorcisms as psychotherapeutic procedures aimed at breaking down the patient's ego defenses and introducing psychological crisis. 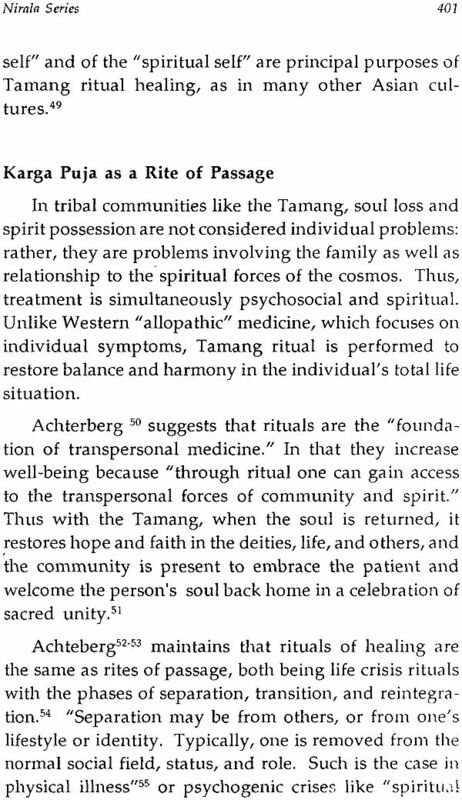 A full-length chapter is devoted to Karga Puja ritual, a dramatic event, successful in treating indigenous categories of mental illness. 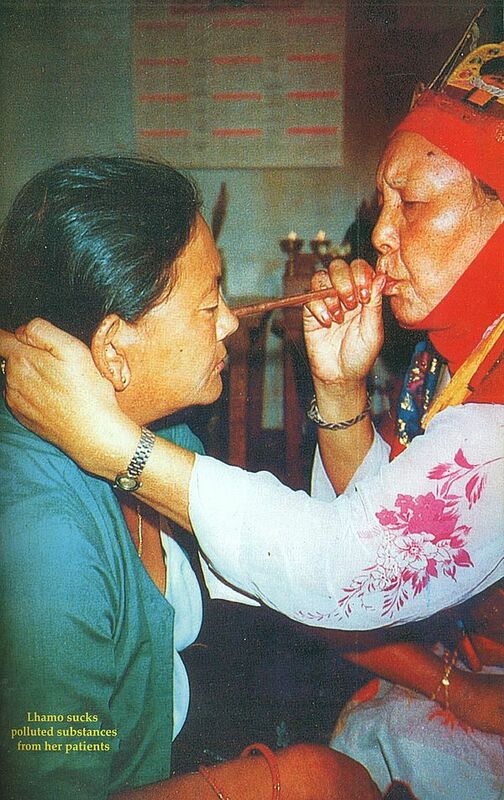 The book ends with a survey of shamanism and medicine in developing Nepal. 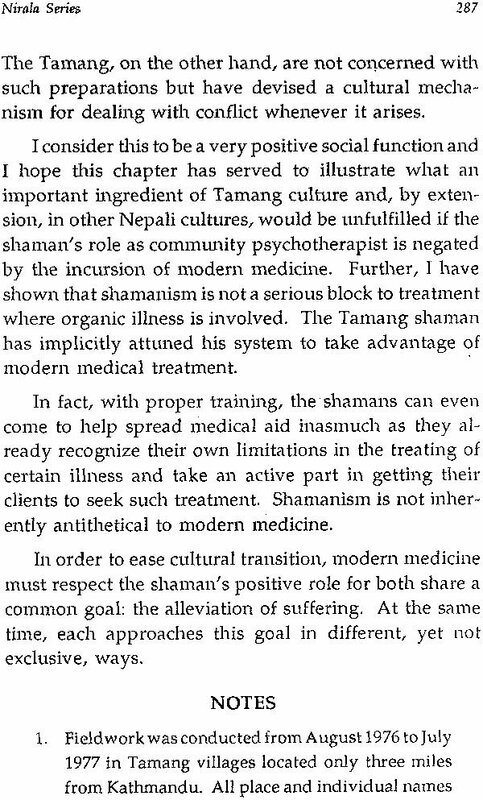 Shamanism, Dr. Peters suggests, is not antithetical to modern medicine; "In fact with proper training the shamans can even come to spread medical aid inasmuch as they already recognize their limitations in the treating of certain illness and take an active part in getting their clients to seek such treatment." A few months later unfortunately a series of crises befell Peters' family. A rabid dog bit Peters and a few days later his son and his wife Carol Peters contracted hepatitis. Instantly, like a typical Western individual, he rushed to seek immediate Western medical aid available and got himself admitted in a nearby hospital. To the anger and humiliation of his shaman Guru Birendra, Peters realized he hadn't even once thought of consulting him. "So scared was I of the thoughts of possibility of death that I didn't even once think of him." On getting discharged from hospital Birendra visited him and admonished him to keep his fingers crossed. "What will villagers think if they learnt my disciple didn't call me when illness struck". Crestfallen, Peters accepted his betrayal of his Guru and realized the great gulf that existed between him and magical powers of shamanic healing. As Birendra left, Peters had a strange dream in very lurid, vivid colors. In that dream he saw himself running down the street of Boudanath pursued by an enraged bull. In an attempt to escape he ran on top of a garbage heap and found he held a stick in his hand, which magically turned into a bright yellow and black snake. He used it as a whip to chase the bull away. He cracked it on top of his head and it sounded as loud as a thunder. Then he heard a voice reciting what seemed to a mantra and turned around to see Birendra. 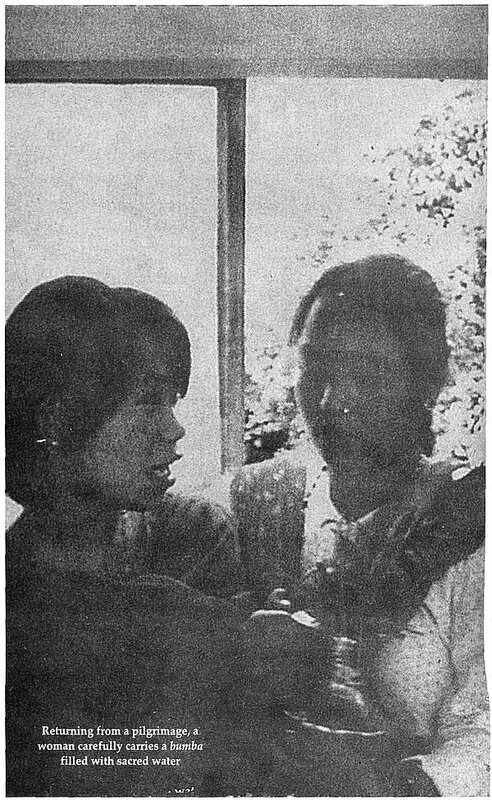 Later the dream was interpreted by Birendra as an assault of some jealous shaman's evil spirit on Peters, his disciple, to kill him. And approvingly Birendra believed, by using his Guru's magical powers, Peters had survived, sending the enemy spirit away. Birendra declared him as his true disciple and offered him his magical dagger as an emblem of faith in miracle of shamanic initiation. He also nick named him as 'Sahib Jhankri', a gentleman shaman. 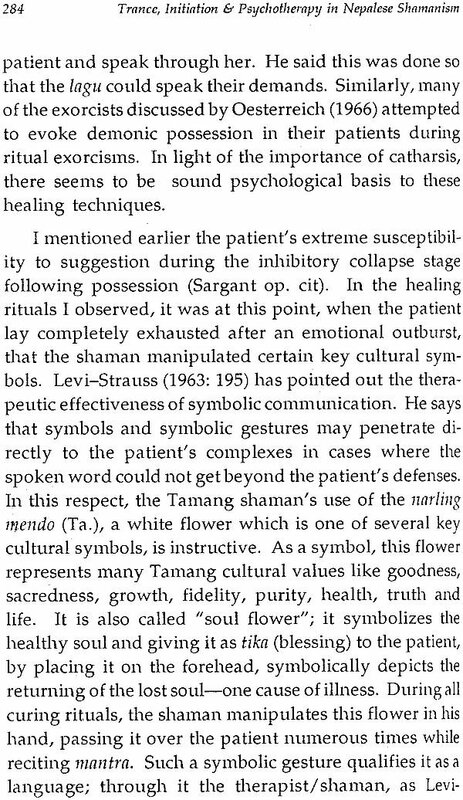 "Shamanic healing heals only those who have faith in it "believes Peters. His pilgrim's progress from a skeptic with the 'stiffness of the neck' to an initiated shaman in the Tibetan tradition is not accidental. After his Guru Birendra passed away he came to Ama Bomboof Boudanath, a Tamang woman shaman, "the kindest and wisest shaman" Peters believes, he has known in his life. 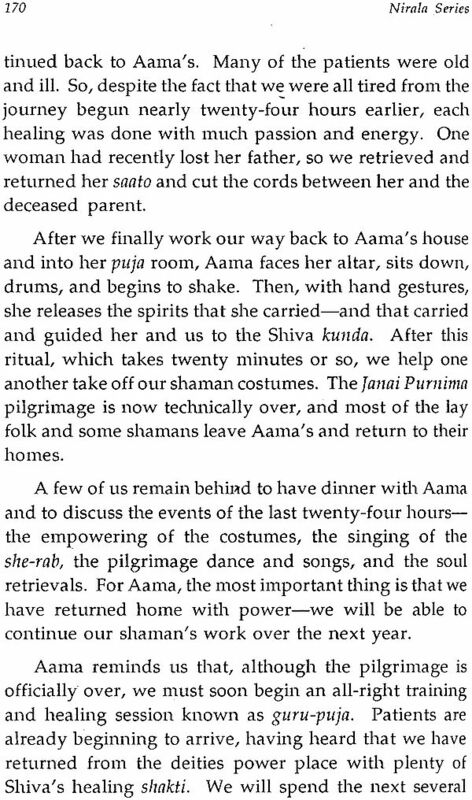 "After all these decades of my apprenticeship as a Jhankri I feel shamanism is not just a psychological system of healing but a powerful spiritual system of healing". 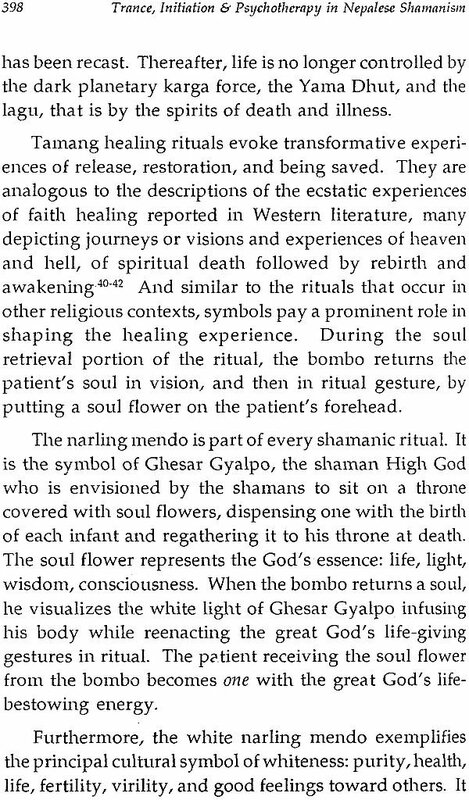 Now not only his ancestors possess him during his trance-states but also he encounters-his deceased Guru Birendra, present Guru Ama Bombo, Ghesar Gyalpo, Dhang Selmo and Tibetan shaman Tom Din Dorge, the winged horse spirit, during his soul journeys. When I first met Larry Peters I had pronounced my doubts very loudly. 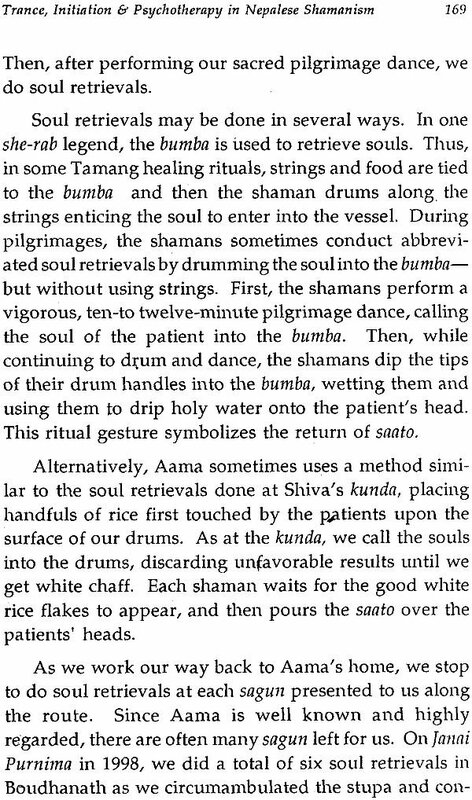 "In Nepal", I had argued, "most of the people and the Press presents shaman as an evil, a fraudulent individual reveling in the practices of witchcraft and black magic". "No, not most people," Peters had immediately checked. "Educated people yes, maybe and that might include Press as well", Larry continued with a calm of an ascetic. "The main problem is the Western Educated Nepalese individuals. But surprising not many people in West think like them anymore. The problem is you people have taken worst of Wes without realizing the West has already risen to value the East. And the worst of the West that you have so painstakingly learnt wouldn't let you see the wisdom-treasure hidden in you. 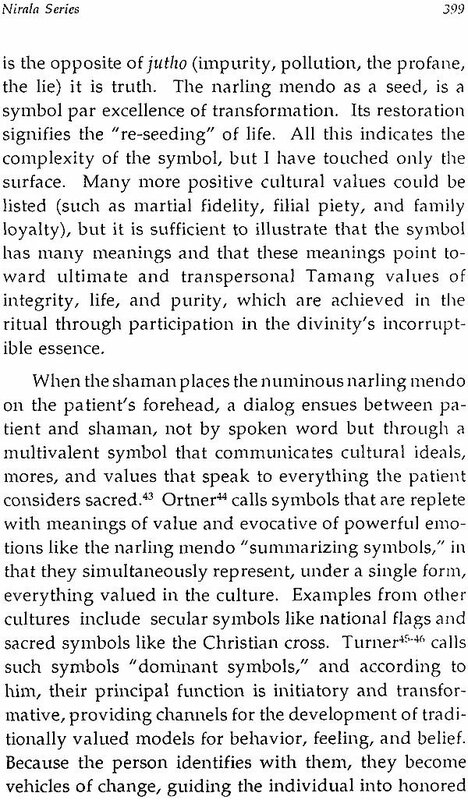 Shamanism is one such rare mine of riches that you people have turned blind to. Shamanism is human kind's first meditative tradition. Shamans were first to explore the inner space in a disciplined way". "Shamanism," he continued, "overlaps with and is at the origin of other spiritual disciplines like Yoga, Vipasana and Tantra which have continued the development of the discipline of spiritual transformation. Shaman's mystical path is an archetype, a universal pattern. It's not just a prehistoric or dead artifact, as most of you might believe but a living tradition possessing same vital psychological foundations as later mystical traditions".